Leah Moroz of the Beach Market on Queen Street East. Photo by Surina Nath. If you’re looking for a local boutique with Canadian crafted products, head to 1936 Queen St. E. to visit the Beach Market. Opened since March of this year, owner Leah Moroz has brought a collection of unique artisan vendors to the area. Moroz has been a local in the Beach for 23 years, living on the same street as her shop. She has moved around Ontario, from Scarborough to Pickering, Bowmanville, Oshawa and Loretto; after graduating from Georgian College, Moroz left to live in the Caribbean for 25 years. “I lived in the Dominican off and on throughout my life, it’s beautiful, I would love to try setting up customer accounts down there as my spring-summer clothing collection for 2019 is almost ready” Moroz said. After graduating from college she worked in tourism and would take clothes down south to sell them at markets right on the beach. “I still try to go back often, the last year was the longest I’ve been away from the heat” Moroz said, pointing out as she has been busy with her store since its opening on March 1 of this year. “My vendors rent out spaces from me allowing all sales going directly to the artisan. It is expensive to have a storefront in the Beaches; this is a way that everyone can benefit from the business” said Moroz. Shoppers who visit the store will discover new Toronto brands such as Sara’s Soaps and Candles and The Candi Factory undergarments; as well as local Beach brands such as Mindmade’s Mala Jewlery and Yoga Apparel, Andrea Oliver’s Ayurveda healing rituals, Little Tree Mama and Me Baby Organic Botanical skincare, and affordable home decor pieces by artist Katie Besler. 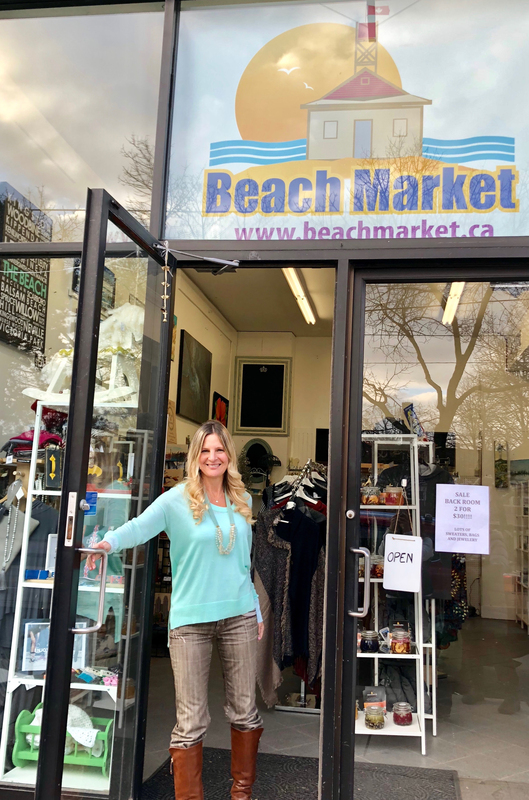 Moroz is always trying to find new, creative ways to bring traffic to the store; and the Beach Market also offers making custom clothing for clients. Customers can come in and select items from a catalogue with more than 300 pages of products. Costs will vary depending on colours, fabrics and quantity. Moroz also develops and brands her own products, selling them to stores when the designs are finalized. Supporting the local community is important to Moroz, and to kick off the holiday season the Beach Market is hosting a Christmas Event on Saturday Dec. 15. Everyone can come in and enjoy some eggnog, and browse the goods available from the local artisans.